FIRST STEPS INTO THE LIGHT! Here's a photo of me, G3PHO, trying to burn a hole in my hand! Seriously, it demonstrates the laser transmitter used in a recent test with Barry, G8AGN. 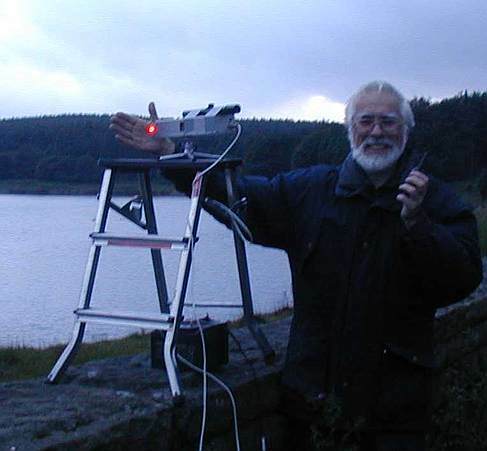 On the 2nd of July 2004, Barry and I carried out a simple TX/RX test across the Redmires Reservoir in Sheffield. Barry had made both items of equipment and was anxious to see if they would work over a short path. 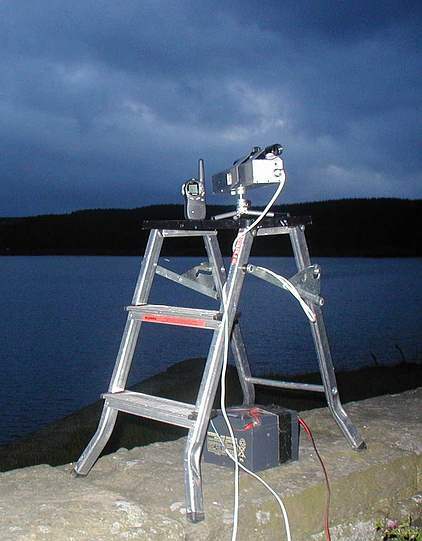 I operated the transmitter unit which was mounted on a very small tripod and placed on an aluminium step ladder, which in turn stood on a stone wall! We didn't need a more sturdy mount in view of the short distance (0.6km) involved. On the right you can see the laser as seen by the receiver at the other end of the path. It's a very intense red light, even in the comparatively bright evening conditions. 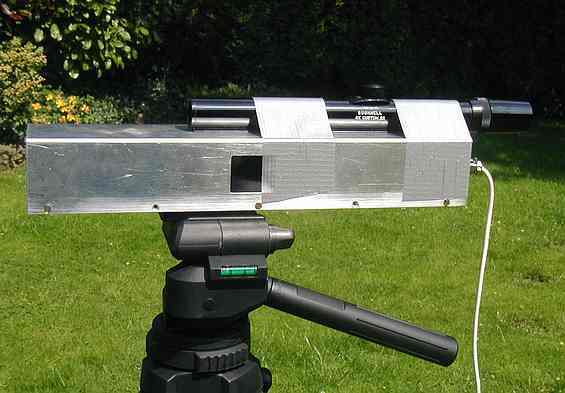 The receiver was mounted on camera tripod, adequate for this test but certainly not steady enough for the long distance paths we have planned for future tests. These lightwave tests remind me of my early days on microwaves, back in the 1970s, when equipment was light weight and low power(a few milliwatts). The sheer simplicity of early 10GHz wideband equipment encouraged me to climb mountains with it to increase distances worked. I can see myself doing this again but with the lightwave gear this time! As with microwave contacts, a liason (talkback) frequency is used on another band. For the lightwave tests we used low power, licence free, 70cm (446MHz) handhelds. These are very cheap to buy in the UK (less than £20 for two units!) and have a useful range of a few kilometres. Naturally we will revert to the more usual 144MHz ssb for longer paths we hope to try in future. The photo on the right shows the lightwave receiver constructed by G8AGN. It has an OPT210 photo diode and AF amplifier, set up behind a 100mm glass lens (a hand magnifier from Maplin Electronics). Barry found that B&Q (and other DIY stores presumably) sell a nice piece of black plastic tubing, made by Marley and used for ventilation ducting through brick walls. The tube is about 250mm long and the lens is a reasonably snug fit inside. 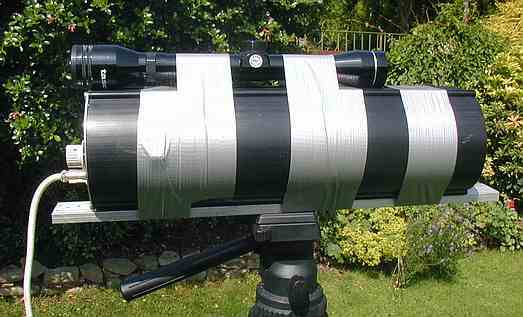 At present, the tube is stuck on Barry's camera tripod with duct tape! emitter follower. This produces an unmistakeable tone in the receiver. 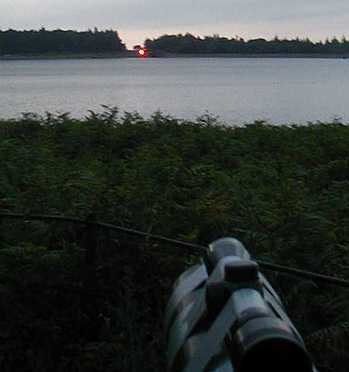 In fact I could clearly hear it coming from Barry's receiver across the lake, a distance of 0.6km! Note the telescopic sighting tube mounted on top of the laser housing. This has a cross hair sight to enable accurate pointing of the equipment. Further tests are planned and we hope to exchange reports via speech modulation instead of the tone. We have a long way to go to reach the high standards already established by our more experienced lightwave friends G8LSD, G0MRF, G0FDZ and G3GRO but it's going to be a lot of fun along the way!